In his address, the VHP leader announced various schemes for poor Hindus, such as collection of food grains from affluent families and distributing it among the poor. AHAMEDABAD: Vishwa Hindu Parishad leader Pravin Togadia today asked the Centre to tread the path of Sardar Vallabhbhai Patel and enact a law to pave way to build Ram temple in Ayodhya. Addressing a 'Hindu Sammelan' held at GMDC ground here, Togadia asked the VHP cadres to be prepared to march to Ayodhya if the Centre does not make such a law soon. "The only way to construct Ram temple in Ayodhya is to walk the path shown by Sardar Patel. 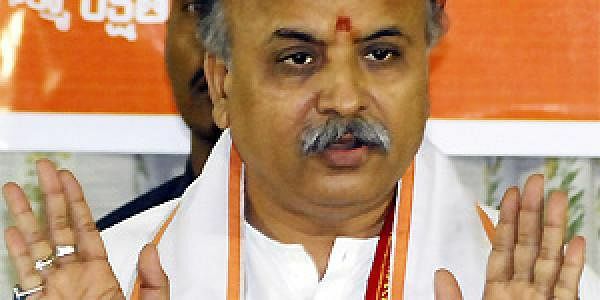 Instead of engaging in deliberations with Muslims, he just went ahead and constructed Somnath temple with the consent of Central government at that time," said Togadia. "The political leaders who just talk about Sardar, need to walk on that path too. To construct Ram temple, the Parliament must enact a law. This is the only way to realise our dream. "If the government does enact such a law soon, then get ready to march to Ayodhya," said Togadia, who is VHP's international working president. "I also urge the workers to eradicate unsociability from our society by making one friend from Dalit community," said Togadia, who then gave a slogan "Hindu First." Thousands of VHP and Bajrang Dal workers from across the state had converged at GMDC ground to listen to Togadia and many other leaders, including VHP's joint general secretary Surendra Jain and Bajrang Dal chief Manoj Verma. Referring to the BJP's victory in Uttar Pradesh and the subsequent appointment of Aditya Nath Yogi as the state chief minister, Jain said the country is embracing the saffron colour. "The entire nation wants to see a grand temple in Ayodhya. We are entering into the saffron era as people who were against Ram temple were defeated," said Jain. Togadia also asked the government to enact a law to control Muslim population as he claimed the community members were extended benefits from the taxes paid by the Hindus. "As per my knowledge, around 95 lakh Muslim students get free education from the taxes paid by us. The Muslim population is also rising. To stop it, a law should be enacted. I am not talking anything communal here, as this law will be applicable to everyone," said the firebrand leader. He also asked the government to deport illegal Bangladeshi immigrants, saying it will ensure employment to more than 3 crore Indians. This person is a racist and anti-muslim bigot! Who is he to build a temple on land owned by another party? This group of Hindu terrorists must be stopped!